I came home because I have been yearning to spend time with my mom, who is 82 years old. This is a picture of her when she was only 17 years old, just before she married my father. She is very independent and strong. She never likes it when I offer my good advice to her as to how she should organize her life. Imagine that. I will not give her any of my advice while I’m here. I will only listen. She and my oldest sister are avid quilters and they make beautiful things. Unfortunately I did not inherit the gene for careful and intricate stitching. So – in the few short hours that I’ve been home we’ve caught up on quilting news and knitting news and plans for a bit of home redecoration. All while watching Fox & Friends. Oh dear. If only I could talk to my mother without Bill O’Reilly or that other ninny, Sean Hannity, yammering on in the background. But I vow not to discuss anything political and I promise not to change the channel to MSNBC when she isn’t looking. 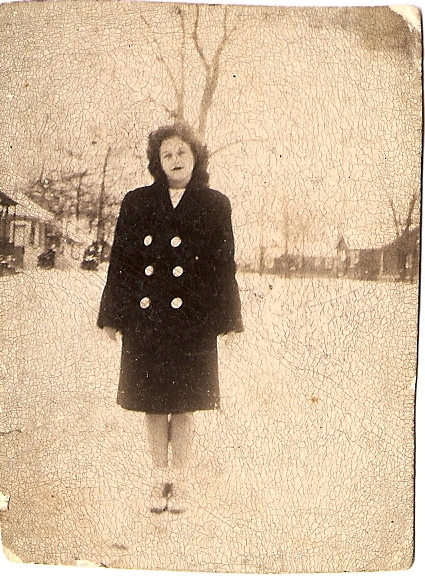 I love the photo of your Mom….are those saddle shoes she is wearing? I remember mine. I know!! I have a few old photos of her and they’re really sweet. Yes – those are saddle shoes. And guess what? I used to wear them when I was a kid, too! Fox and Friends? I can’t watch more than five minutes of that program without wanting to put my foot through the television. My mom is 90 and she hates Fox News, so that’s not a problem when I visit her. The Ben-Gay she slathers on every morning is what drives me crazy. When my mil lived in her own house about the only TV she watched was cricket matches! Now, she says it’s all rubbish and the the “older people” turn it up too loud because they’re deaf. She says she reads. Glad you got ahead of Sandy. That’s so funny about the older people turning the TV up too loud.